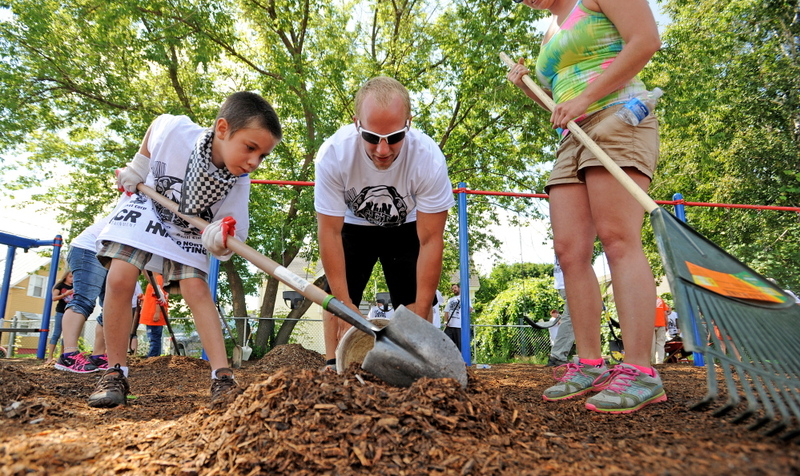 South End's Moor Street park benefits from The Get Filthy Foundation and other volunteers. So he started a community service group, The Get Filthy Foundation, which raises money for those less fortunate and gets down and dirty, helping with community projects. On Saturday, Kay and more than 60 other volunteers were spiffing up Moor Street park in the city’s South End. They were digging, raking, mulching, painting and building a large sand box for the children to play in. “This is the end of town that gets forgotten, unfortunately, and we really wanted to do work in a part of town that needed it,” Kay, 30, said. He and his band, Northern Lights Nation, started the foundation this year and is in the process of procuring nonprofit status for the charity, he said. Kay, a booking agent for GCR Entertainment, Cameron Madore, 29, who works for T-Mobile and Ryan Durgin, 30, who works in his family’s painting business, started the hip-hop group in 2009. Since then, it has garnered a loyal following, particularly from people in Waterville where the group is based, according to Kay. Many Northern Lights fans from Waterville attend performances all over the state and were wearing foundation T-shirts and volunteering in the park Saturday, he said. He said the group performs in Portland, Bangor, Auburn, Lewiston and other places; in September, it will perform at the Boston Freedom Rally at Boston Common. The group spread the word about Moor Street park on Facebook and dozens of volunteers showed up early Saturday, including children and families who live in the South End, Kay said. 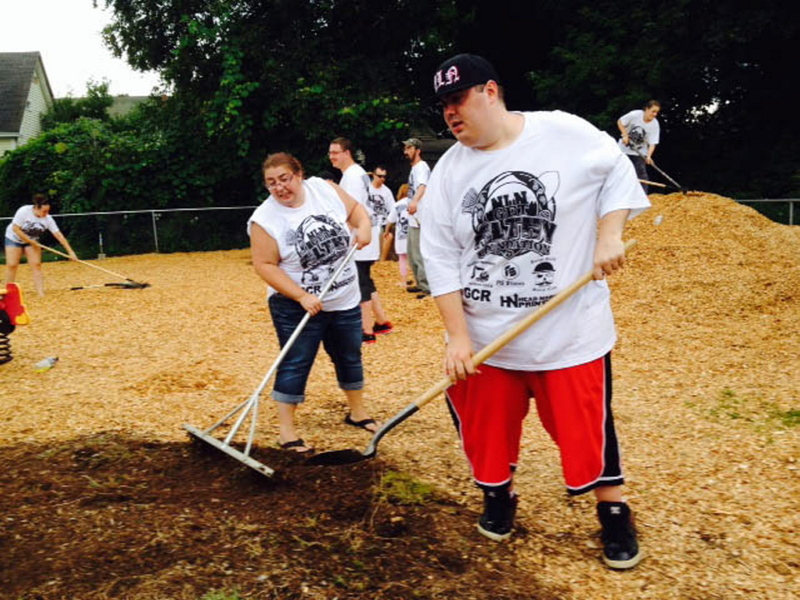 The Home Depot sent volunteers and equipment and donated money, Cappza’s Pizza donated some pizza and offered a discount on additional pizza and the city provided the cedar mulch, according to Kay. 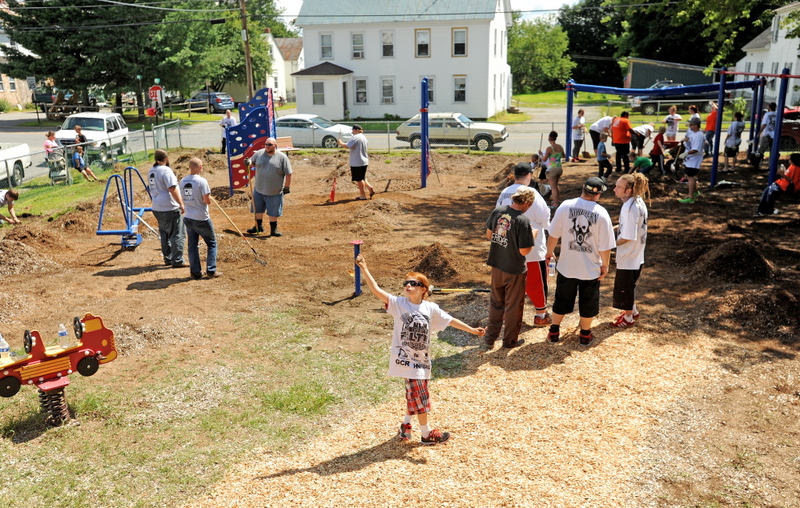 Wellness Farmz, of the Sebago area, donated materials to build a 10-by-10-by-12-foot sand box, and The Rough Gents Social Club, a new social club in Waterville, came to help. Ballard-Milligan Gravel Corp., of Dresden, also donated cash. 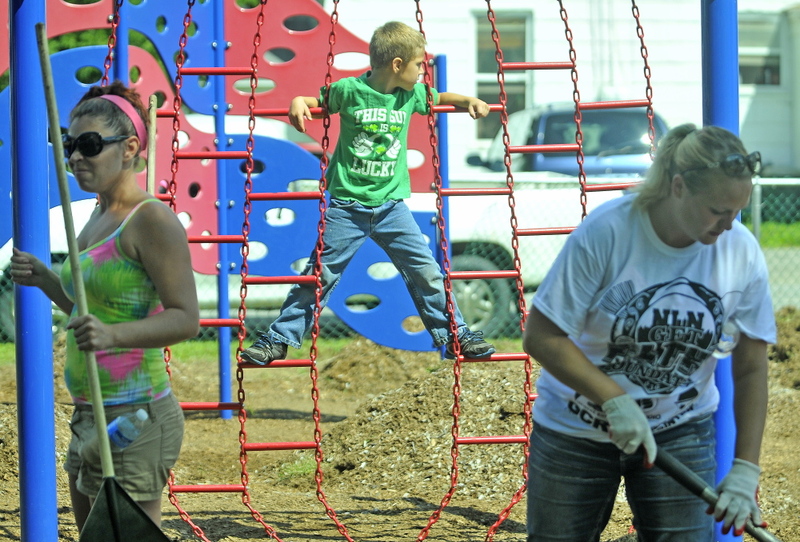 Kim Ragsdale, of Farmington, helped organize the event and got in touch with Waterville Parks & Recreation Director Matt Skehan to discuss what the group would do at the park. Loud music played from equipment set up in the driveway of George and Angela McAdoo next door to the playground. 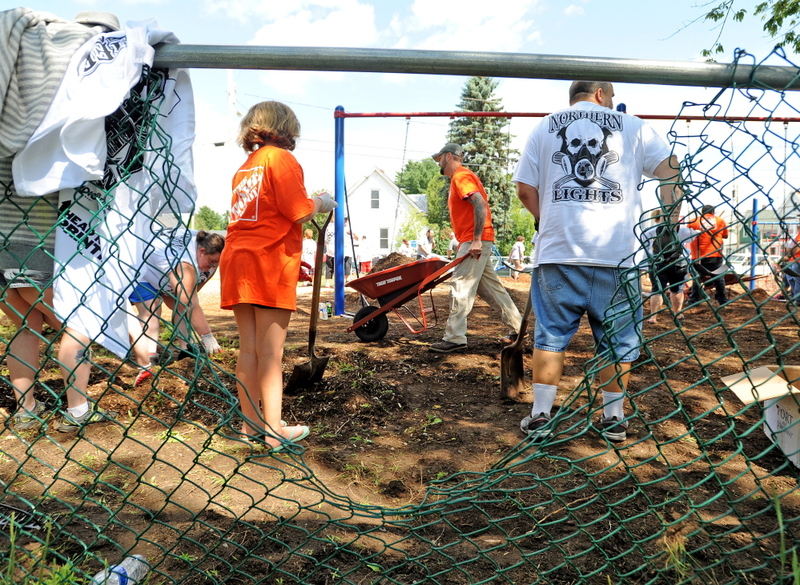 The Home Depot’s volunteers, Team Depot, help out in parks, schools and other venues. Team Depot Captain Jared Wolman and team volunteer Dave Pullen said they brought equipment including wheelbarrows and shovels and helped move mulch and sand, among other things. “We’re more than happy to help out,” Wolman said. Charlotte Moody, 9, of Winslow, and her mother, Cissy, were hauling mulch. They said they are former neighbors of Kay and wanted to volunteer because they love parks and spend a lot of time in them. “I’ve been helping, pulling the grass and raking the wood chips and now I’m trying to use the wheelbarrow,” Charlotte Moody said. Cissy Moody said her daughter learned about the volunteer effort Saturday and urged her to take part. Kay said the group plans to come back next year and install a slide at the park.